This grand block of the month quilt from Jo Morton features an exclusive Jo Morton fabric line. 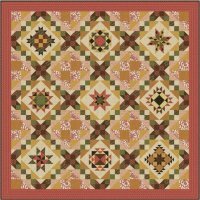 Finishing 100" square, Jo's Prairie Rose is a 9 month program for $24.99 a month. Sunday Stitching Society is this Sunday. There are five Sundays this month and Sunday Stitching Society meets on the fourth Sunday, which is March 23. Wednesday Stitching Society is this Wednesday, March 26, too.